International Journal of Research in Health Sciences,2013,1,2,53-61. Department of Community Medicine, 1- Assistant Professor Dayanand Medical College & Hospital, Ludhiana, Punjab, INDIA. 2-Professor Government Medical College & Rajindra Hospital, Patiala, Punjab, INDIA. 3-Associate Professor, Government Medical College & Rajindra Hospital, Patiala, Punjab, INDIA. 4- Assistant Professor, Sri Guru Ram Das Institute of Medical Sciences & Research, Sri Amritsar, Punjab, INDIA. 5- Professor of Psychiatry, Government Medical College & Rajindra Hospital, Patiala, Punjab, INDIA. Introduction: In Punjab, drug addiction is a cancer which is crippling the mental and physical well being of the youth population of Punjab. There are 15 DDCs supported by Indian Red Cross Society in Punjab and many private DDCs are also functional. So this study is an attempt to know the profile of patients taking treatment from these centres. Materials and Methods: 7 DDCs run by Indian Red Cross Society & 3 DDCs being run by Private registered societies located in various districts of Punjab were included. A pretested questionnaire was used to interview the patients who were admitted. Results: 120 patients were interviewed. All were males. 47.5% were in age group of 20-30 years. Mean age of starting drug abuse was 21.15±5.29 years. 79.2% patients started drugs due to peer pressure. 59% belonged to rural area. 46% were in upper middle socioeconomic status & 65% patients were married. Patients were using more than one route and 13.3% were on IDU. As per single drug usage, 20.8% were addicted to alcohol & 20.8% to capsule. As per multiple drug usage, 62.5% were tobacco addict, 42.5% to alcohol & 40.8% to capsule. Rs 170.63 was the average amount spent per day. 85.0% patients were dependent on self for buying drugs. 16% patients had positive family history of drug abuse. 60% patients were brought to centre by family members. 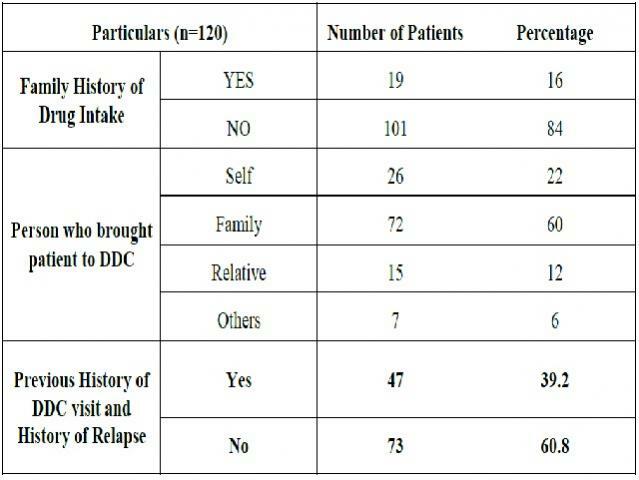 39.2% patients had positive history of previous treatment at any other DDC. Conclusions: It is recommended that both Red Cross & Private DDCs should be checked regularly by authorities like Civil Surgeon and Deputy Commissioner & private centers should also be supported & promoted by the government so that these centers run in a better way & can provide more facilities.